Grind the buckwheat groats, almonds and flax into a fine flour using a spice grinder. Put the flour mixture into a food processor and add the dates. Process until the mixture is well combined and forms into a wet dough ball. If it doesn't, add a tablespoon of water. 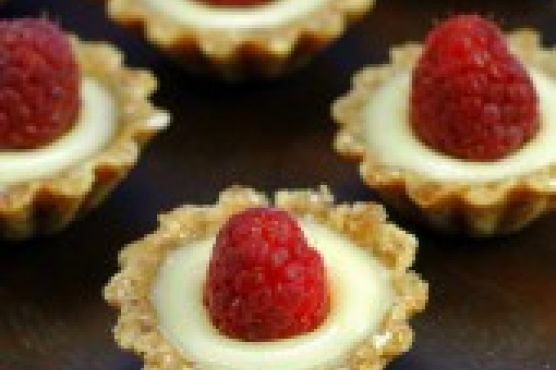 Cut out small pieces of plastic wrap and place them in the bottom of mini tart tins.Form small balls with the dough mixture using your hands and flatten them into thin disks that are large enough to cover each tart tin. Press them into the bottom of each tart tin and cut off any excess around the edges. Place the tarts on a dehydrator tray and dehydrate at 110 degrees for 2 hours. Carefully remove the tart crusts from the tins and remove the plastic wrap. Put the crusts back on the dehydrator tray and dehydrate for another 2 hours. The crusts should be firm but still flexible.In a medium bowl, whisk together all ingredients and allow it to sit for about 15 minutes with the bowl sitting in a larger bowl of warm water.Strain the mixture through a mesh strainer and discard the remnants.Fill the crusts (recipe above) with the strained lemon mixture and refrigerate for about 2 hours to set. Store tarts uncovered in the fridge until ready to serve. Tartlet on the menu? Try pairing with Cream Sherry, Moscato d'Asti, and Port. A common wine pairing rule is to make sure your wine is sweeter than your food. Delicate desserts go well with Moscato d'Asti, nutty desserts with cream sherry, and caramel or chocolate desserts pair well with port.